Former ABC journalist Peter Mares, author of ‘Borderline’, was in Perth during the February 2003 International Writers Festival. Sonia Tascon, lecturer at Fremantle's Notre Dame University, took the opportunity to interview him about the book. Sonia Tascon: Your career has spanned quite a few years in journalism, you've been a commentator, you've been an author and now you're an academic at Swinburne University. Peter Mares: Temporarily - they've given me a visiting fellowship, which is three months of fellowship, which I've spread out and done part-time. So Swinburne really enabled me to do the revised edition of the book, because they were providing me with the time to work on researching and revising the book, which ended up being a much bigger job than I anticipated. I thought I'd be able to do it in a few weeks, but it was six months' work, really, because as I began to look at the material, post-Tampa, I realised that so much had changed that the book needed to be restructured and a lot of stuff needed to be added in along the way. It wasn't just a matter of adding an extra chapter, the whole nature of the politics, the whole nature of the law, had changed. It's about forty per cent new material, and Swinburne research fellowship enabled me to do that more easily that I could have otherwise. Sonia Tascon: The new Borderline looks quite different. Peter Mares: Some of the chapters are more or less the same, as in discrete stories like the story of the East Timorese asylum seekers, which is part of the whole issue, but it's a separate story in itself. Not much had changed there, so I just had to update that a bit. But in areas like the legal regime, that needed to be fundamentally rewritten. I added a lot more about Temporary Protection Visas, and the implications of those visas as they became much more apparent as a big issue. And of course, I had to do a completely new chapter on the 'Pacific solution' and the Tampa. It meant I broke chapters up and moved them around. Sonia Tascon: Speaking about Borderline itself, then, what particularly about the refugee issue led you to write about it in book form? 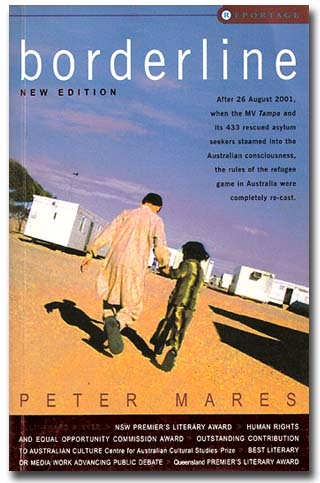 Peter Mares: A number of things: I had been interested in Australia's treatment of asylum seekers and refugees for a long time, and then in the early- to mid-1990s had followed the situation at Port Hedland Detention Centre, with mostly the Cambodian and Indo-Chinese asylum seekers. I had been particularly concerned in 1994 to discover one fact, which I discovered in the course of doing a radio broadcast, and that fact was that an asylum seeker who arrived in Australia by boat and was detained, was not informed of their right to legal advice. That is, they were locked up and were not told they had a right to see a lawyer. This shocked me - I'm not a lawyer, but a very basic understanding of the law, to me, is that your rights are meaningless unless you're informed of your rights. I did a story in which I interviewed an Immigration Department official, a senior official, live on air, and asked him outright whether people were told this, and he said no. I was taken aback by this - I mean, I suspected it, but I didn't actually believe that they would just admit it. And they did. I guess he was telling the truth, and he was honest in that interview. That struck me as very worrying, because, if any Australian could be detained and not told of their right to see a lawyer, we'd see that as a fundamental breach of our rights, and yet this was happening to people in Australia. If they asked for a lawyer, they would get one, that was the policy, but they weren't told that they could ask for a lawyer, and that seemed to me to be a deliberate evasion of basic rights. That made me interested in the issue, and then I worked in Vietnam for two years, from 1995 to 1997. This was at a time, of course, when the whole story of Indo-Chinese displacement was coming to an end, if you like, because the camps in Southeast Asia were being closed and people were being sent back to Vietnam; people who'd not been recognised as refugees were being sent back to Vietnam from Malaysia and Indonesia and Hong Kong. I did stories on that side of it, too, talking to families who'd been returned to Vietnam about what had happened to them, and this alerted me to the fact of the great story to be told about the individual stories of people who had moved. For example, a family I met who were in the city of Hai Phong, a port city near Hanoi. They spent something like eight years in a detention centre in Hong Kong. They had young kids, one of them was born in the detention centre, and, eventually, they decided to come back to Vietnam, because it was clear that they weren't going to get resettled in the US, or Australia. They weren't refugees under the definition [those conditions set down in the 1951 Refugee Convention], they were economic migrants. What they came back to was a Vietnam that had changed and that had passed them by, in a sense. The woman had been a kindergarten teacher, and when she came back, she couldn't work for the kindergarten anymore because that was state-run, and the principal said, 'Well, she's not a trustworthy person: she left the country'. Their friends who'd lived in houses fronting the street had been able to set up little businesses on street corners because Vietnam had opened up economically in that time they'd been locked up - but all those immediate opportunities were taken. There was no easy place for them to get into that business world. They were massively in debt, because, of course, they'd sold everything they'd owned to leave. They'd borrowed money to leave - they owed that to people. They had no house - they had to borrow money to build a house when they got back, to find somewhere to live. And they were very ashamed, they were deeply ashamed, because they'd left and they had failed. They had come back. That alerted me, I suppose, to the very human nature of these stories, of displacement. I actually believe that policy was right, that those people in the camps in Southeast Asia who weren't refugees ultimately did have to go back to Vietnam, difficult as that was and messily handled as it was. Ultimately, that was the best option for them, and the best policy. But that didn't mean that they didn't suffer greatly in the process. I was interested in those stories, and then the case of the Timorese in Australia, the East Timorese and the way in which they were so hypocritically treated by first the Labor Government and then the Coalition Government, in terms of these people were clearly fleeing persecution at Indonesia's hands, and were then told when they got to Australia, 'actually, you can go to Portugal'. Then, Australia was one of the few countries in the world formally recognising Indonesia's sovereignty over East Timor. It was just such hypocrisy, and they'd been so ill-treated. That was May '99 when I discussed the book with publishers and agreed to write it, and then in the second half of '99 we saw a massive increase of boats as the smuggling effort out of Indonesia became much more sophisticated. We saw the large numbers of Iraqis and Afghans and Iranians coming on that route, and the whole story changed as I began to write about it and became a much bigger, national story. Sonia Tascon: It's a very complex story, and obviously that's what you became involved with as you started to research more of it - it was the human element that got you interested in the first place. Peter Mares: Yes, it was the human element and it was the desire to write and tell stories. I did want to write a piece of reportage, that is, the type of journalism that involves storytelling and making your issues not through academic argument or through facts and figures but as much as possible through weaving the analysis into the stories, and trying to use the stories to illustrate the issues. And also allowing myself to appear in the story, not the typical journalist approach where you never talk about yourself. I didn't want to make myself the story, but to admit, perhaps, to my own fears, my own anxieties - the issue of Australia being swamped, and the fact that I'm not immune to that sort of latent xenophobia and the exploitation of that by those in power in Australia, also, my fear of getting too involved, of being unable to actually help people, because these people do need a lot of help. I was trying to be honest with the reader about my own anxieties as well, not to cover them up and pretend I was some magically objective observer. Peter Mares: I suppose what I didn't say was a motivation is that - and remember the time I began this was 1999 - I felt that this was one of the great under-reported stories of Australia. The detention of asylum seekers, including children, the detention of families for long periods of time, was seriously under-reported. It was covered in a veil of secrecy and indifference. I knew, I suppose from the Vietnam experience I related earlier, there would be compelling stories to tell - compelling personal stories of struggle and hardship, regardless of the rights or wrongs of the issue. I did feel it was under-reported, I felt it was badly reported, on the whole, very sensationally reported. Of course I wrote the book with the desire to influence public policy. I have no bones about saying that: I am a journalist and I wrote it as a journalist, and I tried to be balanced, and I tried to grapple seriously with the arguments of the government, not to dismiss them. I tried to be very clear about using non-emotive language. I don't talk about concentration camps. I have deliberately tried to use, clear, precise language. But of course, I am making a very strong case and I am a critic of our current approach. Sonia Tascon: Were you trying to reach a wider audience? Peter Mares: Absolutely. I was trying to have an influence. I ask myself, 'Why am I writing a book that might sell a few thousand copies if it's successful, when I work in the media and I can reach much larger numbers of people by writing articles or by talking on the radio?' I think the reason for that - and there is an 'ego thing' involved, of wanting to be published and wanting to have your name in print, something substantial, and wanting your parents to be proud of you - but part of it was about books being, somehow, more enduring than a newspaper article, and the ability to put together a more comprehensive approach to the issue. To tell those personal stories and then look at where that leaves us, and to argue through the policy. The best, most rewarding feedback I've had from readers is that they say, 'I've never been a political person before, and I was uneasy with the Government's policy, so I got your book. Now I've read it, I go and visit Maribyrnong Detention Centre every fortnight. I have someone I visit there'. People finding a way, partly through the help of my book, in which they could work out their position on this issue and decide what consequences to draw from that for themselves - did they want to get involved or didn't they, did they want to lobby harder within the Labor party if they were ALP members, did they want to join protest marches. I feel good that, I hope, I have enabled people to make up their own minds about this issue in a more informed way. Sonia Tascon: It is an issue that can be very emotive for those who are already sitting close to more sympathetic views. The book is a very accessible way of becoming informed. Where do you think your book sits in the refugee social movement, as such? It has moved, from the research that I've been involved in for the last two years or so, from the late 'nineties to being a very strong chorus. Peter Mares: That's a difficult question, because at the same time as, clearly, I felt I had a political point to make and I wanted to influence opinion and policy, I have also drawn a distinction between myself as a journalist and observer, and an activist. I haven't become active in any of the refugee groups, and I made a conscious decision not to do that. I speak at public meetings and conferences and seminars, but I'm not campaigning or attached to any particular organisation. I've done that deliberately, because I felt concerned that it would give people grounds to attack my position as being a position of a group rather than that of an independent observer making an assessment of a situation. And also, as a question of energy. In order to keep body and soul together, you can only do so much in this life and I see my role as attempting to analyse the policy issues, to talk about the issues for whatever audience wants that. I haven't seen myself as an activist and I don't see myself as an activist, and I don't go visiting people in Maribynong or other detention centres, and I don't organise protests or rallies. In that sense, I've also been reserved about doing stories on this issue in my day job with the ABC. Most of the work I've done on this has been freelance work that I've done in my own time, which I feel has given me a greater freedom. Not that I haven't done stories with the ABC - I've done stories on Nauru where it's been relevant to my work with the Asia-Pacific, but I have not pushed that agenda within the ABC. If people to call me to comment, I'm happy to comment, and where I see a story that fits the editorial concerns of the program I'm working on I'll do it, but I won't try to force it onto the agenda. Sonia Tascon: in your role of analyst, how do you see that the refugee social movement has gone from when you started thinking of refugees until now? Peter Mares: I think there's been an extraordinary change in attitude in Australia, and there's also been an extraordinary change in the media coverage. There is still much sensational and ill-informed media coverage, of course, at the tabloid end and the talkback end of the media, but if we look at serious journalism - the broadsheets and the ABC and SBS - I think there has been a sustained effort by journalists, since about the fourth quarter of 2000 when the stories about Woomera and allegations about child sexual abuse at Woomera broke. There have been much more concerted efforts by journalists and editors to get beyond the veil of official secrecy and the boundaries around the detention centre, and to find out more about what's going on inside. Now, that's been assisted by people coming out of those detention centres after the middle of 2000, being able to talk about their experiences inside, people released as refugees and then being in the community. It is also been a shift in the media's approach. Papers like The Australian and The Age have taken, at times, quite strong positions on some of these editorial issues. So there's more information out there. My book is part of that, but there's a lot more. There has been some very good, detailed reporting, even a very good article in The Women's Weekly [June 2002], for example. 'Behind the Wire', I think it was called. So that has helped shift things, but also there has been this groundswell of people saying - a guy in Wangaratta, who founded the Rural Australians for Refugees group, said to me in response to the kids overboard affair - he said, 'There comes a point where you realise that you've got to draw a line in the sand. I'm not going along with this anymore, this is something I have to oppose'. And there is this very vocal, committed and broad minority - I think it is still a minority of people - who are very deeply concerned by the direction Australia has taken on this issue. So you see a great diversity of stuff going on: church groups, Rural Australians for Refugees, letter-writing campaigns, adopt-a-friend in detention, through to the more radical kinds of activism like protests outside of Woomera. I think it's quite extraordinary: the range and extent of the activism and the depth of passion that accompanies it. Sonia Tascon: In my own interviews I have come across those very comments from volunteers working with refugees on TPVs [Temporary Protection Visas]. They say, 'I've never been political in my life before'. What do you think has sparked the imagination of these people to the extent that they are moved to contribute? Peter Mares: I think there are different motivations. Sometimes it's because of someone's own personal background - they know that their father or grandmother was a refugee or an illegal immigrant some time in the past, and they can see the double-standard involved here in Australia as an illegal immigrant nation in its founding years! People see that. So that's one motivation: people may have personal motivations that stem from their own family history or experiences. The other one, I think, is a feeling of deep concern about the direction of Australia under the Howard Government and the type of social division that has emerged in Australia, and, in my view, the refugee/asylum seeker issue has been at the tip of that wedge that is dividing Australian society. So it has also been the point where a lot of people have felt, 'Well, if I'm going to do something then this is the issue on which I'll have to stand'. And then there's just the basic kind of human decency, heart stuff. People saying, 'These poor buggers. They've been in this horrible place, Woomera, and they're being let out. What can I do? The way I can voice my personal opposition is to treat them nicely'. Sonia Tascon: Do you think, then, that refugees are the human face of a bigger issue? Peter Mares: Yes, in a sense. I think there's another element, too, to the broader movement, which is that some of the energy that has gone into other issues in the past like, say, reconciliation, where reconciliation has now stalled. There is no forward movement, the reconciliation movement has run up against the brick wall of the Howard Government's obduracy on this issue. You can see that it's not moving forward under Howard. So people have, maybe, seen a new area where they feel they can have some influence, and so there's some shift of activism from other areas. But that's more people who are already active politically and who see this is an issue on which they feel it's important to get involved. Sonia Tascon: You mentioned on Friday in The State We're In panel [see this website for audio from the event] that refugees embody the failure of States. Peter Mares: I'm quoting someone else, there, by the way. A guy called Arthur C Helton, a US lawyer and analyst who's written a book called The Price of Indifference. He talks about refugees embodying failures of statecraft. And that makes sense - everyone who has had to flee from a conflict or persecution shows our failure to have prevented that conflict or that situation of persecution. Of course, we're not omnipotent. We're never going to be able to solve all those problems, but it's a warning to us to think about the consequences of our actions. Sonia Tascon: The quotation made me think of that global responsibility that we're grappling with at the moment. That brings in the whole question of the agenda for protection and the changes to the Convention relating to refugees. What do you think are some of the changes that need to be made to the Convention? Peter Mares: I don't think that the Convention itself necessarily needs to be changed. I think we need to have a change in attitude from one of the individual, nationalistic, defensive postures - that is, 'keep them out of my country' - to one of 'how do we tackle this issue collectively?' In a sense, the comprehensive plan of action on Indo-Chinese refugees developed in the eighties does offer some kind of model. It was very flawed, but this was the regional and global approach to the movement of people out of Vietnam, in particular, and also Cambodia and Laos. The elements of that were that you had to look at the motivations of people for leaving, and you had to work out why they kept taking these risks, and work out what you could do that would enable them to stay where they were or leave in another way. There were, on the one hand, there were screening procedures put in place, so people arriving would be screened to see whether they were facing persecution and whether they could go back to Vietnam safely. Secondly, orderly departure programs were set up so that people wanting to get to Australia or France or the US had another option. They had another route to go, for example, if they had relatives working in the government of South Vietnam and had legitimate reason to fear persecution and they already had relatives in Australia and the US. So there was some kind of orderly mechanism for them to leave by. Thirdly, there was some kind of incentive for people to go back, some kind of develoPeter Maresent of economic programs for returnees. All of those things, as I said, were very imperfect and flawed, but at least it was a more global attempt to look at the issue. It was one of the points at which that Vietnam, as an isolated, Communist country, became more engaged with the international community to everyone's benefit. It involved the transit countries like Malaysia and Indonesia and Hong Kong, it involved the resettlement countries and ultimate destination countries like Australia and France and the US. That's the kind of approach we need. It requires countries in the west to offer incentives as well as deterrents. That is, incentives to stay where you are, incentives to return to your homeland, and realistic alternative options to flight with people-smugglers, which is not a desirable outcome. It suggests a reorientation. The trouble is, with our government at the moment, we are flying in the exact opposite direction: refusing to adopt UN protocols, moving away from the notion of an international rule setting and abiding by those rules, as we can see by the potential that Australia will go to war without UN endorsement. Sonia Tascon: It's been suggested that refugees are the unwanted, and we certainly have seen that here in Australia. As you mentioned earlier today, other countries are following the model of Australia and introducing legislation practices similar to Australia. Why do you think that they are such an unwanted group. Peter Mares: Alas, it has always been so. If you look at the situation of Jews in Europe in the 1930s, who were unsafe in Germany, no other country wanted to take them. Partly that was due to the anti-Semitism that existed in those countries. This is not new, this is history. Yet, the irony is that often it is those countries least able to offer support that are the most generous - the way Pakistan hosted two million Afghan refugees for a very long time. It seems to me that there's this kind of inverse relationship: the richer a country is, the less willing it is to render assistance. What was your question again? Sonia Tascon: Why are they the unwanted? Peter Mares: Why are they the unwanted? It's complicated, but the legitimacy of governments is partly based on notions of protection for citizens, and part of that protection is the notion of protecting the border. These are not things you can dismiss. This is part of the notions underlying the nation-state. Sovereignty. One of the guiding, ordering principles of the modern world. You can't just dismiss that, suggest that people shouldn't be worried about border protection - of course they're going to worry about border protection. It's part of nationalism, it's part of our identification with nation. So that's part of the problem, and it's not easy to convince people that, 'Yes, you're worried about your borders, but we need to find a more creative solution to this problem'. We have to address the problem in a way that doesn't result in people coming in an uncontrolled manner. And perhaps there's a way that can manage those fears. Again, I think that happened in the seventies with people coming to Australia from Vietnam, in the seventies and early eighties under the Fraser Government, where Fraser stared down the opposition, more or less. There was a lot of opposition to Vietnamese coming to Australia. And he weathered it. He showed leadership. That is the kind of thing you need - you need leaders who will take people with them. Sonia Tascon: Do you think racism as an issue comes into it at all? Peter Mares: I think there's no question that it does, and not only race but the fear of difference - the fear of Islam at the moment. In the eighties it was more fear of the 'Asian hordes', and now it's more fear of the 'Muslim hordes'. The nature of that fear shifts around, and the configuration of who the embodiment of the fear is shifts all the time. Certainly, those elements come into it and shape it. Sonia Tascon: I know that the majority of the Australian population, if the ABC Online survey is to go by, are opposed to the war against Iraq, but do you think that there are similarities between what we've done to the refugees and what Howard and twenty per cent of the population, at least, would like to pursue war with Iraq? Do you think there are commonalities? Peter Mares: There may be some commonalities, but I think there are more differences. I think that much of the opposition to war on Iraq is partly bound up with a sense of nationalism, which is offended by John Howard going along so much with a US foreign policy ambition, and without showing any independence from that ambition. There is an element of anti-Americanism there, I think that's latent in Australian society, and there's a sense that this is slightly undignified - the way in which Australia has adopted the US policy as its own without clear debate in Parliament or much public debate. Margo Kingston put it the other night as not taking the people into his confidence, not really discussing the issue with them. So, in that sense, I think it's different, because on the refugee issue, the Government was really exploiting the fears, the fears of invasion, fears of difference and so on. Here, they're actually trying to steamroll over people's fears. People are afraid of the war and what it might bring, but the Government is refusing to pay any attention to those fears, which are very real, I think. I do see differences rather than similarities at this stage, and I do think that public opinion is quite fickle on both these issues. For example, if there is UN endorsement by the Security Council of an attack on Iraq, then I think public opinion will swing behind it, because it will be seen that this is the international community, this is what the international community has decided, we do want a rules-based system in the world, the rule has been set and we should abide by it. So that's one thing too - that Australia's willing to go outside the UN on this. On refugee issues, we saw how public opinion, while there's great hostility to people who arrive on boats without authorisation, there's was incredible show of generosity to the Kosovars and East Timorese who came here on Temporary Protection Visas. The Australian population is capable of magnificent generosity and goodwill. To see the population as immobilised by racism and xenophobia is probably not helpful, because it suggests that there's not much point in doing anything. Sonia Tascon: Leadership seems to be what we're asking for the refugee situation to shift, yet it doesn't seem to be doing anything for Iraq. What are the differences? Peter Mares: I see what you mean. I think the Government, with Iraq, is not convincing us. It hasn't got a convincing argument. And we're talking about much bigger stakes, with Iraq, we're talking about weapons of mass destruction, we're talking about potential conflagration in the Middle East, we're talking about Australian soldiers potentially being killed, whereas with the asylum seekers, we're talking about unarmed civilians seeking shelter. If the Government had taken a different line with asylum seekers, there would still have been people who were afraid and who thought it was wrong, and would have campaigned to sink the boats, and so on, but I think the Government could have got acquiescence for its policy, at least. It wouldn't have been an issue that won or lost elections. It didn't need to be an issue that affected elections in that way. It might have increased the vote - if the Government had taken that position, Pauline Hanson's party might still have done better in the polls, but they would still be a minor party. Sonia Tascon: As this is a writers' festival, and you are a journalist as well as other roles we discussed earlier, many of those are in writing. How do you see the nexus between writing and our political, cultural and social lives? Peter Mares: I still think of myself as a journalist, really, but I'm thrilled to be invited to writers' festivals, because then I can call myself a writer, and that seems slightly more noble and intellectual than being a journalist - journalists have a pretty bad reputation in Australia. It's interesting, as I said earlier, when I wrote the book, I sometimes asked myself why I was writing a book when I can reach more people in the mass media. You don't make any money writing a book - you slave away at it, it's a difficult process, it's rewarding in many ways, too, but ultimately, because it helps put things on the record, and it's a document that has a greater shelf life than a photocopy of a newspaper article. It's in libraries, people can teach it and put in on their syllabuses in university courses, so I do see writing as being a way of engaging in public debate in a slightly more sustained way than in the media, which is very 'hit and run'. You do a story one day and it's swamped the next. The asylum seeker issue has pushed reconciliation off the agenda, the Iraq issue can push the asylum seeker issue off the agenda, and so on.